Add some prettiness of puffy tulle fabric into your table settings. This fabric was intensively used in designing wedding gown embellishments and fancy dresses. Our 2 Layered Pleated Tulle Tutu Table Skirt collection offers event professionals a charming way to decorate their tables for special occasions like Christmas parties, cocktail parties, bridal showers, weddings, baby showers and anniversaries. 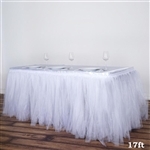 These affluent Tulle Tutu Table Skirts can effortlessly beautify dinner tables, birthday cake tables and gift tables. The layers of sheer tulle fabric swaddled around wedding tables or banquet hall tables will attain festive mood in special celebrations. 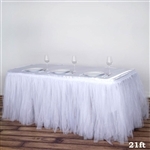 These bulk-priced 2 Layered Pleated Tulle Tutu Table Skirts can also be used for room decoration, draping a vanity or game table. An ideal option for uplifting the themed-based kid's birthday celebrations, our wide collection embrace great color scheme options.